Wining and dining is a staple of Auckland culture, and lucky for us JAFAs, we’re spoilt for choice—with plenty of picture-perfect decks to wine and dine the day away. There’s nothing quite like sipping on a cocktail while dining on fabulous food surrounded by spectacular views—particularly in Auckland. Here’s the City of Sails’ best decks to spend your long, languid days. Bon Appetit. Ostro is nestled within the upmarket Seafarers building, and it's the perfect sun-drenched deck to wine and dine in the summer months. Offering up spectacular views of the Waitemata Harbour, it has a great menu by top chef Josh Emett. Park yourself on the deck and start with the seafood platter—oysters, grilled clams, prawns and Hiramasa kingfish crudo. You’ll be in seventh heaven. Move onto the mains and choose from options like pan-roasted market fish or the crispy skin poussin. Just make sure you leave room for dessert. Whether it’s the brandy snaps or ice cream and sorbet collection, your belly will be in bliss. When it comes to your drink of choice, we recommend you ask the Ostro team. They’ll pair each dish with the best alcohol—all you need to do is soak up the views. Dr Rudi’s is where all the cool kids hang out. And with good reason. Start the night at one of their bowling alleys, then head out onto the deck. With views over Wynyard Quarter (and all the yachts you’d be buying if you won Lotto), it’s a great place to perch for an arvo. The Beers and Shares menu offers a selection of scrummy plates you can share with the whole crew. Stuff like beer battered pickles, and the jalapeños and brie poppers. Pair them up with a house-brewed beer from Dr Rudi’s on-site brewery and you’ll be happy as Larry. Just down from Dr. Rudi’s, you’ll find Soul Bar and Bistro. Their infamous deck boasts ocean views and hanging baskets overflowing with flowers. Their menu is worth raving about, and it's a particular favourite among seafood enthusiasts. You'll find options like grilled snapper, organic Clevedon oysters and whole flounder. They’ve also got other dishes for the non-seafood-loving folk out there, with some pretty special pasta mains and sides. Once you’ve selected your meal, it’s time to match it with a wine from Soul Bar’s epic wine list. Drink up. Tucked away above Victoria Park Market is the restaurant and bar, La Zeppa. Boasting an extensive deck, adorned with colourful lanterns, it’s a must visit. This Mediterranean-style eatery knows just how to show you a good time. Their laid-back menu features tapas, platters and mains, with options like paella, baked polenta with kale, mushroom and truffle and braised short ribs. They often have live music, and so wash it all down with a cocktail from the bar and you’re good to go. The Riverhead Tavern is situated in the northwest ‘burb of Riverhead and has a sprawling deck that overlooks the river, with big trees providing shade to diners. Their menu features options like the classic eggs bene, the Smugglers breakfast with bacon, Portobello mushroom, tomato, hash browns and ciabatta bread, all accompanied by alcoholic options like Bloody Mary's and Mimosas! The Riverhead Tavern is New Zealand’s oldest riverside tavern, so visiting this place means visiting a piece of New Zealand history. There’s even an option to catch a ferry from the city out to the tavern—all dependant on the tides, of course—making this establishment a fantastic option for functions and parties. Auckland’s Viaduct is buzzing, and The Parasol & Swing Company is just one more reason to visit one of the City of Sails’ best spots. Spread over two levels, you can expect stellar cocktails, boutique wine and a menu created by none other than Mark Southon (of O’Connell St Bistro fame). Dig into a burger, sip on a cocktail and soak in the views. Could life get any better? 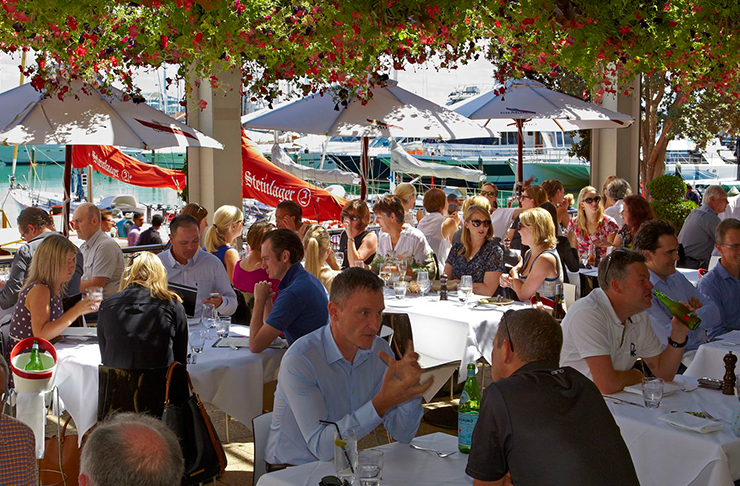 No round-up of Auckland’s best decks would be complete without Harbourside Ocean Bar and Grill. 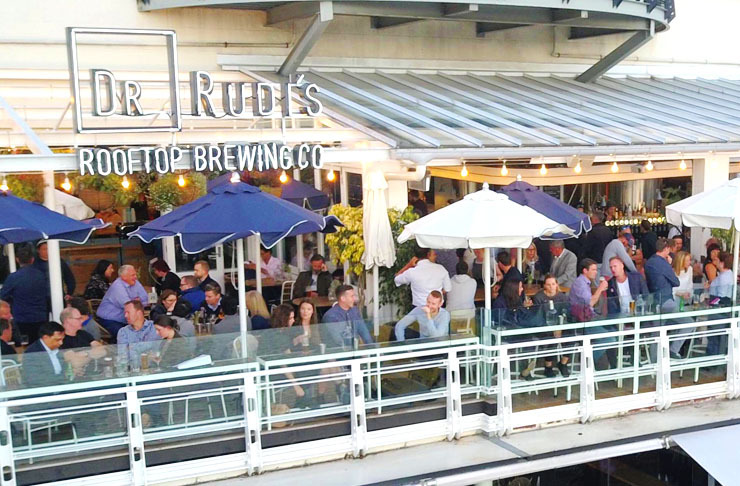 Situated in the ferry building on Auckland’s waterfront, this establishment is allll about their seafood and an epic deck to eat it on. With spectacular harbour views, Harbourside’s menu is something to get excited about. Options include the classic fish n’ chips, Fiordland crayfish and grilled Hapuka. Don’t worry if you’re not a seafood lover, coz they’ve got other tasty options like steak Diane and the roasted Cambridge duck breast. A fave among North Shore residents, Regatta bar and eatery is a gem within the heart of Takapuna. It's got stunning sea views of Takapuna Beach, and of course a sun-drenched deck to wine and dine on. Regatta’s menu includes Kiwi favourites like fish n’ chips, as well as fresh market fish and oysters. Wash your meal down with a beer or wine from the bar, and enjoy that stunning beachfront view. Nestled away on a hill in Oneroa Beach, Waiheke, Mudbrick Vineyard and Restaurant is a pretty amazing venue. It boasts four separate areas, including a stunning deck. Situated either in front of the main restaurant or as a part of a private function area, sit back and soak in the views of the vineyard and harbour. All of their dishes are meticulously put together, with options like the antipasto platter, braised octopus, parmesan gnocchi or the slow cooked lamb shoulder. The presentation makes them almost too good to eat…almost. Another stunning vineyard featuring a fabulous decking area for wining and dining is Stonyridge Vineyard on Waiheke Island. The decking overlooks the sprawling vineyard and backs onto a sheltered courtyard area, draped in grape vines. It’s the perfect cosy space to spend an afternoon sipping on a glass of red, white or rosé…or what not all three!? Just a hop, skip and jump from Auckland CBD, this immensely popular wedding venue and fine dining restaurant features a view of the gardens from the decking area. Bracu’s menu is truly something to get excited about, with an à la carte option, degustation options, a separate Saturday night and Sunday menu AND a dessert and cheese menu. Oh, and did we mention they’ve got a wine library!? This quaint, family-run eatery is all about fresh and locally grown ingredients. Matakana Market Kitchen’s quirky menu offers categories, making your food selection just that little bit easier for you with options such as: “something hearty,” “something teenage,” “something wrapped,” and “something on the side.” Then they’ve got a completely separate gluten free brunch/lunch and dinner menu. And after you’ve selected your meal of choice, you can pull up a pew on their deck and enjoy a Kombucha or a brew from the Leigh Sawmill. Nice. If you find yourself out West and feelin’ like a quick bite to eat, stop in at Piha Café and park on their deck. Their menu is simple but satisfying, with options like pizza and beer, sammies, salads and home-made sausage rolls. It’s the perfect preparation before spending a sunny afternoon splashing around in the West Coast waves. Fish n’ chips, sammies, pastries and gelato are served up seven days a week, all year round at Takapuna Beach Cafe. Dine on the deck, which sits on the promenade facing Takapuna Beach and enjoy a gelato smoothie or a home-made soda, with tangy options like pear and ginger or rhubarb. Grab a friend and head out to Villa Maria Winery for a leisurely day of wining and dining on their deck, which faces the Ihumatao vineyard. Their award-winning wine isn’t the only reason to make the trip out South. The menu features amazing platters like the winemakers’ platter, featuring Puhoi cheeses, cured meats, smoked salmon, olives and antipasto, or their vegetarian platter with smoked Portobello, eggplant parfait, winter veggies, heirloom tomatoes and Puhoi cheeses. Newly opened, Urban Verge café is a little retreat from the hustle and bustle of the surrounding ‘burbs, nestled on the verge of Cornwall Park. Take in the serene surroundings their decking area, while sipping on a coffee and enjoying a meal from their brunch menu, which offers New York bagels, eggs benne, French toast or GF crepes, among others. Arrr me hearties! If it’s seafood you’re after, then this viaduct eatery is the place to be. Swashbucklers is quirky and full of life, so eating here is never a bore. Their menu offers up all of the options you'd expect from a seafood restaurant, including shrimp cocktails and ye classic fish n’ chips. Better yet, you can enjoy it all while basking in the afternoon sun on their picture-perfect deck, facing the Westhaven Marina. Gourmet comfort food and a great craft beer bar are what makes this eatery something special. Situated down on Auckland’s Viaduct, The Nightingale has spectacular views from their deck and their equally spectacular menu features options like the slow roasted lamb shoulder, fried halloumi burger, Vietnamese-seared tuna salad and pulled pork BBQ burger. The Nightingale also has live music and DJs spinning tunes on the weekends AND the venue can be booked out for private events. It’s no wonder this hot spot is humming with people from open to close. Another fave Viaduct eatery of ours is the Lula Inn. Lula has a fab indoor/outdoor decking area where you can choose to bathe in the afternoon sun or hide away in a shaded wee corner. It even has an outdoor bar where you can order up a refreshing cocktail. Their menu is filled with Kiwi classics with a twist, such as the smoked Kahawai scramble, Orere point lamb chops, beer battered fish and chips and tempting sweet treats like the pineapple lump chocolate fish. Lula’s is also home to live music every Thurs, Fri and Sat, so go for a meal and stay for a boogie. Parked up next door to Lula’s is White + Wongs. Their eclectic East meets West-style menu is absolutely packed with flavours. With red curries, Peking duck, soft shell crab, dumplings and bao buns and tasty desserts like deep fried ice cream with butterscotch and the lemongrass pandan brûlée, there really is something for everyone. Their modern, bright and bold décor makes this establishment a fun option for dining on the waterfront, and their decking area sits right on the water, so you can take in the harbour views while you eat. Soak up some sun on The Vodka Room’s outdoor decking area, while enjoying a menu of Russian fare mixed with Middle Eastern, Central Asian and European influences. This bright, bold and luxurious bar and restaurant is home to more than 100 different types of Vodka, a handful of private dining rooms AND karaoke rooms—which, might we add, come with their very own “push for vodka” buttons! The menu offers up options like The Vareniki which is pan-fried potato and cheese dumplings, and Kotlety, which is a twist on a fish cake dish—served with flounder and scallops. And it’s not a Russian restaurant without a classic Stroganoff. Accompany your meal with a delicious vodka cocktail or two and finish off with some karaoke. Nestled away on the Island of Waiheke, The Oyster Inn situated just a short walk from Oneroa beach. Pull up a seat in their outdoor decking area and sit down to a delightful meal, a pitcher of sangria, and let the sounds of the nearby ocean serenade you. Their menu offers up selections like market fish with Vietnamese slaw and summer gnocchi with asparagus, kale and broccoli and sweet treats like chocolate fondant with vanilla ice cream and berry coulis. For a truly relaxing afternoon in the sun, this is the place to visit. Ampersand’s open decking area looks out over onto the Orakei Basin and is a fave among Eastern suburb locals. Their menu features options like chia pudding and chocolate brioche toast for brunch, organic chicken terrine, crayfish tortellini and pork belly for lunch and dinner. And they’re even open for dinner on Christmas Day and New Year’s Eve. With a relaxed and unpretentious vibe, you’ll feel right at home sipping on rosé and enjoying a meal here in the afternoon sun.